Shibboleth includes a default login page. The $shibboleth_home/conf/login.config file is used to configure the authentication method. For example, let's say you want to authentication to an LDAP server. In $shibboleth_home/conf/attribute-resolver.xml, add your LDAP server information again. By default, the UsernamePassword section of the $shibboleth_home/conf/handler.xml file is commented out. Remove the comments to enable username and password authentication. You will probably want to set Shibboleth logging to ALL if you are setting this up for the first time so that the LDAP events are written to idp-process.log. Restart the Tomcat application server that idp.war has been deployed to and then check idp-process.log. Be aware that it can take a while (5 mintues or longer) for Tomcat to produce the app. This may be some issue with Shibboleth and LDAP. 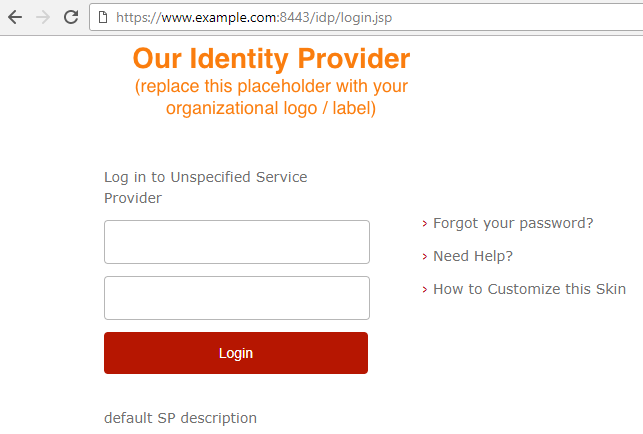 Once the app is coming up, here is a sample of a failed authentication attempt due to an invalid LDAP DN. On the other hand, this is an example of a successful authtentication attempt. Do not be too terribly surprised or worried if you get an error after signing in. This is quite common when first setting up Shibboleth, and simply means that you've not yet assembled all of the pieces (IdP, SP, app server, LDAP, et cetera). As long as the log has "Authentication successed" you are well on your way.